The Droid smartphone lineup has been some of Verizon’s most popular phones since the Motorola Droid made its debut late last year. In recent weeks, HTC has been leading the headlines with the introduction of two of the most critically and publicly acclaimed smartphones currently available on the market, the Droid Incredible and the EVO 4G. Now, it seems like Motorola is looking to get back into the game with tomorrow morning’s announcement of the Android-powered Droid X. There isn’t much known about the Droid X yet, other than that it will be big. Very big. Verizon’s website shows a side-by-side photo comparing the Droid X with the Droid and the HTC Droid Incredible, and it is noticeably longer than its two counterparts. We also know that it will have a 4.3 inch display, the same size as the EVO’s screen. One of the biggest critiques of the EVO has been its size, which is pushing the limits for some users on how large a smartphone can be while still being comfortable and convenient to use. It will be interesting to see if the Droid X has the same reception as the EVO, or if this larger size is a turn off for some users. The Droid X will also have 720p video recording, HDMI output, and the next generation of Motorola’s Motoblur interface. 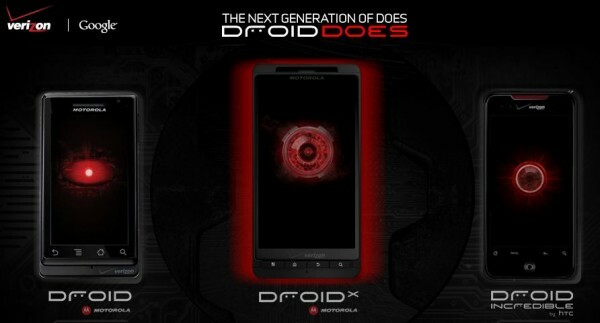 The Droid X will be officially announced tomorrow, June 23. Skatter Tech founder Sahas Katta and myself will be attending and live-blogging the San Francisco event. The press conference will actually take place in New York City, but we’ll also be able to get our hands on the newest member of the Droid family and ask representatives about the phone shortly after. Stay tuned for further Skatter Tech Droid coverage tomorrow as we report live from the event. Update 7:56 PM: Verizon Wireless, Google, Motorola and Adobe will be attending the event tomorrow. We’re hoping this phone will sport Android 2.2 and run Flash 10.1. All this phone is is an EVO 4G minus the 4G capabilities and the front facing camera to allow you video conferencing. WEAK! Why can’t Verizon ask a phone manufacturer to release one of these for their network. I’m starting to believe that Verizon is intentionally asking the phone manufacturers not to release this type of phone because it will kill their network just like what is happening to AT&T. Don’t mind not having the 4G capabilities yet but not having the video conferencing ability is a deal breaker for me for a phone this size. Hurry up HTC, release a EVO on Verizon’s network please. I am guessing battery life may be better since the larger size allows for larger battery. That would be the only advantage over the EVO. If I get an EVO I’ll be bringing along a backup battery at all times. Very helpful. Can you compare + and – features of the X with iPhone 4? Yes, we should be getting an iPhone 4G in the next week or two and once we have a chance to use both phones we plan to do an in-depth compare/contrast piece between the Droid X and the iPhone 4 as well as the HTC Evo. We will also have an infographic outlining the similarities and differences between these three popular smartphones being published shortly, so you should check that out. I completely understand your dilemma Ana. So many new smart phones and so little time! I’ve actually only had a little under a day with the Droid X, so I don’t feel comfortable giving you a definitive “this is better/worse than the Droid Incredible” just yet. You can check out our in-depth review of the Droid Incredible, though, to get Skatter Tech’s thoughts on that phone. In terms of concrete specs, the Droid X and the Droid Incredible are more similar than not (you should check out our two infographics, EVO vs. Incredible, and EVO vs. iPhone 4 vs. Droid X to compare and contrast them), but for me right now the big difference between the two is the aesthetics. My only real problem with the Droid X right now is its size and how it’s too big to fit in my pocket, and while that may not be a deal breaker for everyone it is a bit of a turnoff for me. If you don’t have to decide immediately, I’d recommend waiting a bit until we have more time to play around with the X and can write up a definitive review of it. Otherwise, your best bet is to look at the specs for each and the images and see which one suits your personal needs the best. But my honest opinion is that you will likely be happy with whichever phone you choose.